In December 2015, officials from 197 countries (nearly every country in the world) met in Paris at the United Nations Climate Change Conference and negotiated a global agreement to limit global warming. On Earth Day, April 2016, the U.S. and 174 other countries signed the agreement, with most of the others following suit since then. Politico has reported that senior White House advisors will be meeting this Tuesday, May 9, “in a last-ditch effort to bridge the internal divide over the Paris climate change agreement”. 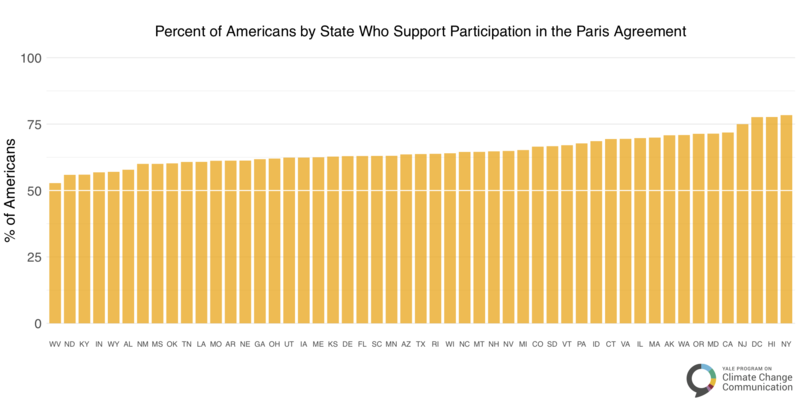 What do American voters in the U.S. and in every state think about U.S. participation in the Paris Agreement? And what do Trump voters think? 1. A majority of Americans in every state say the U.S. should participate in the Paris Climate Agreement. 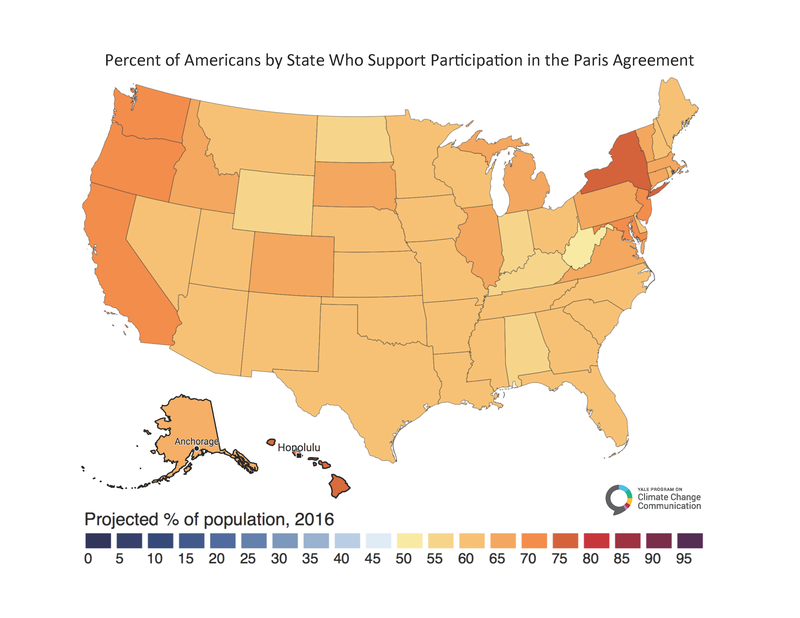 Using methods developed for the Yale Climate Opinion Maps, we find that a majority of Americans in every state say that the United States should participate in the Paris Climate Agreement. 2. 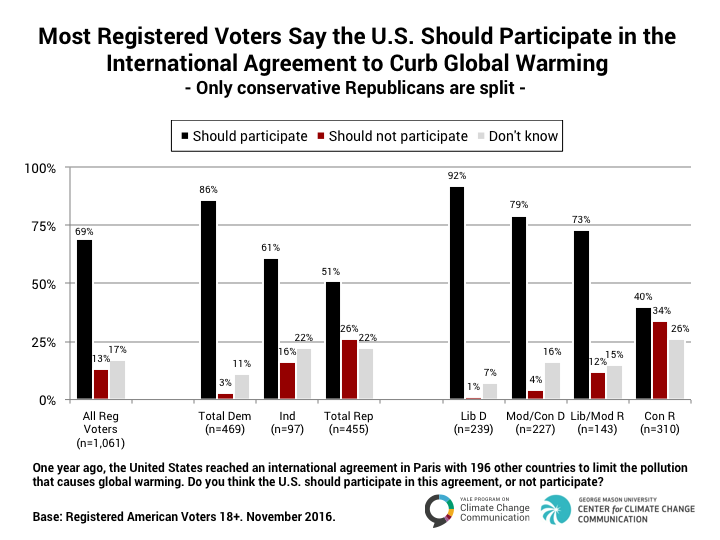 By a more than 5 to 1 margin, voters say the U.S. should participate in the Paris Agreement. In a nationally representative survey conducted after the election, we found that seven in ten registered voters (69%) say the U.S. should participate in the COP21 agreement, compared with only 13% who say the U.S. should not. Majorities of Democrats (86%) and Independents (61%), and half of Republicans (51%) say the U.S. should participate (including 73% of moderate/liberal Republicans). Only conservative Republicans are split, with marginally more saying the U.S. should participate (40%) than saying we should not participate (34%). 3. About half of Trump voters say the U.S. should participate in the Paris Agreement. 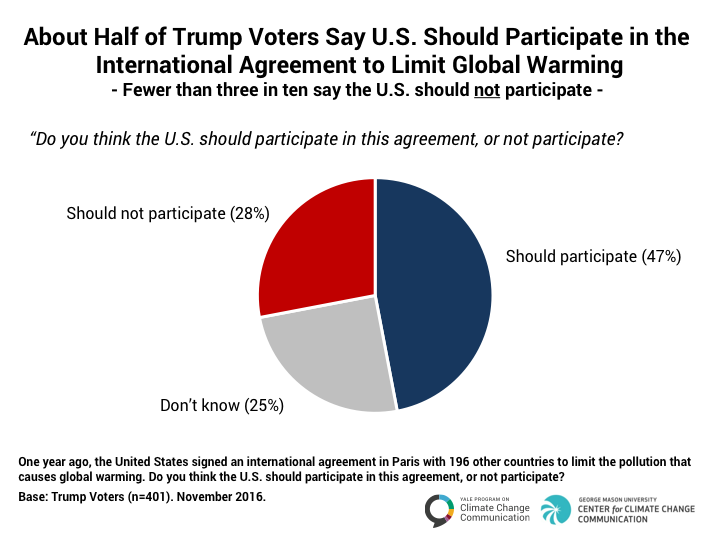 Almost half of Trump’s voters (47%) say the U.S. should participate in the Paris agreement, compared with only 28% who say the U.S. should not. Will President Trump side with the nationalists on his advisory team who want to withdraw from the Paris Agreement? Or will he side with the moderates, including his family members, a majority of Americans, majorities in every state, and a plurality of his own voters, who want the U.S. to continue to participate in the Paris Agreement? This decision may be an important turning point in the future history of Earth. To learn more about the methods used in this analysis, please visit the post here.